Shown below are free ads available in Property for sale, Peterborough, Ontario. You will find classifieds for sale and to buy. Please click a classified ad below for more details or to reply to it. You can use search box above to find other items for sale or services offerings in category Property for sale in Peterborough, Ontario or look in the Peterborough, Ontario neighborhood. Commercial property for sale, lease or rent. 10 acres zoned Commercial/Industrial contains 10000 sq. ft. building complex with an office, heated shop and warehouse. Includes 3 phase hydro, compressed air and unlimited water supply. Can be purchased separately or with the Ontario Corporation that currently owns. Incorporated in 1978, the firm has a good credit rating and 35 years of goodwill in the local business community. Check out our various MLS listings of Condos, Semi Detached Homes, Townhouses, real estate and properties for Sale in Milton. The Best real estate listing, properties, homes for sale in Milton Area. When it comes to Milton Real Estate, our job is to provide you with all the information about MLS listing for sale. Want to sell your home? Contact us and we will help you to find best buyer for your property.. The strikingly stylish Royal Breeze Residences in Ras al Khaimah – United Arab Emirates are at the very heart of the resort, ensuring that no matter where you live, the beach, golf course and marina are always close to home. The private residences at The Royal Breeze have been adoringly designed to create a light and airy environment that encourages a carefree, holiday way of life. Increase the chances of selling your home after downloading and building this FREE backyard Gazebo plans. 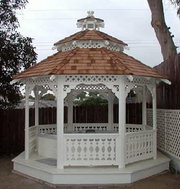 www.FREE-GAZEBO-PLANS.INFO. 1 only. A 2011 Park Model Home 12X44 completely funished. A new manufactoring company in Peterborough is now building Canadian made Park Model homes designed for our winters. These are CSA Approved and exceptable in all Cannadian parks. Check out our website aliparkmodels.com or call 1-866-254-9952. Four year new board and batten, 2 bedroom bungalow. 16 foot cathedral ceilings. Full length front and back covered verandahs yet six dormers allow light to flood the inside of the house. Hardwood flooring (cherry & maple). Beautiful, open concept living/dining room and kitchen. Kitchen features maple cupboards with built-in oven and stove top. Private Lot in Waterfront Community! Listing agent: Tracy Mullin, Call 905-430-XXXX for information. Love The Idea Of A New Home And Want A Private Wooded Lot In A Beautiful Waterfront Community. This Renovated Open Concept Home Is For You! Brand New Kitchen With Huge Breakfast Area, Centre. Point Perry 4BR 3BA, CLASSIC EVOLUTION - PORT PERRY! CLASSIC EVOLUTION - PORT PERRY! Experience lakeside panorama at Stephenson Point! Min. to town & 40 min to 404. Enjoy 152 of hard sand/pebble beach w/gabion basket wall at shoreline. Glistening water vistas & breathtaking sunsets offering all the mystery & beauty of lakeside living. Genuine olde-world patina that speaks of elegance while showcasing timeless character through this well appointed custom fieldstone bungalow w/open cathedral loft & fin. RESTAURANT/BAKERY & RESIDENCE Restaurant & Bakery in Woodview. Beautifully restored buildings, totally up-to-date restaurant and commercial kitchen with all newer appliances and fixtures, this is a fantastic opportunity to own a growing business. It also includes a 4 bedroom home with hardwood floors, an updated galley kitchen, 2 fireplaces, screened porch and 3 bathrooms. Canada, Toronto Area New Home, Architekt designed and build. This exeptional family home represents the perfect retreat for stessed buissenes people.Extensive accomodation approaching 7000sq ft and 44 acre park, gardens and meadows with creek and large pond.Hunting, fishing and boating nearby. Build at highest standarts with many features like "Kachelofen"-fireplace, oak floors, granite and marble bathrooms, detached indoor pool, detached 3 car garage and many more. Huge Lot In Town! 66X 197Ft. Upgrades Galore In This 4 Level, 3+1 Bedroom Sidesplit. Professional Painted Throughout In Modern Colors, This Homes Sparkles. Dark Hardwood Floors, New Ceramics In Front Entrance Way, Kitchen And Baths. Both Bathrooms Have Been Completely Renovated. Pot Lights Throughout House. Clean Bright 3 Bedrooom House (13 years old), 2/3 acre corner lot, paved driveway, custom inground saltwater pool (roman style, with pool equipment and pool shed (fenced) installed 2005 Outdoor storage shed. Open concept, vaulted ceilings, cermic tile, carpeting, Propane heating, R2000, HVAC System, Basement is partially finished, propane fireplace, laundry room, Oak kitchen cabinets, oak stair railings. It's In Move In Condition! The Floors Have Been Updated, The Home Is Painted In Neutral Colours, Updated Vinyl Siding, Gas Heat: This Is A Unique Property. Both Halfs Of The Semi For 1 Price! First Time Buyers Can Live In 1 And Keep The Tenant In The Other, Central Location And Minutes To 401. Extras: 1 Half Is Vacant And The Other Is Tenanted, Please Allow 24 Hours Notice To View Both Halves. Great Exposure To Main Road, Building In Excellant Condition, Includes Established Floral Business With Steady Clientelle, Rental Apts.Fully Rented Plus Legal Office Tenant, Basement Storage. ***Owners Retiring.....Well Known Location, Financials Avail. With Non-Disclosure Extras: Building In Excellent Condition, 1200 Sf Of Retail Flower Shop, 2 Rented Apts & 1 Rented Office. Breathtaking View From This 4+2 Bedrm Raised Bungalow On 18.49 Acres, 6 Stall Horse Barn With Hydro And Underground Water. Two Fenced Paddocks, Double Garage And Workshop With Hydro. New Roof Shingles In 2003. Spectcular North View From Spacious Deck Which Circles Entire Home. Eight Sliding Glass Walkouts From Home, Beautiful Gardens With Bulbs, Perennials And Flowering Bushes Around The Home. Country Bungalow With Luxury Styling. Features Bruce Hardwood Flooring Thruout Eat-In Kitchen, Living/Dining Rooms, Walkout To Deck, 4Pc Semi-Ensuite With 6' Jet Therapy Bathtub, Main Flr Laundry W/Access To Garage, Large Finished Family Room W/Corner Gas Fireplace. 3Pc Bath, Bedroom, Workshop/Craft Room, Bsmt Storage Room, Over 1/2 Acre Lot, South Facing Backyard, Municipal Water, Minutes To Durham & Easy Commute To Gta. Stunning One Of A Kind New Bungalow With 4200 Sqft Of Finished Living Space With Rough In Kitchen In Basement. Att 3 Car Garage Plus 1000 Sq Ft Heated Shop With Ent. To House.Some Features Include Granite, Cherrywood Kitchen, Crown Moulding, Luxury Ensuite, 9' Ceilings, Jacuzzi In Main Bath, Gas F/P, W/O From Kit To 55' Terrance O/L Lake 6' Cherrywood Floors Throughout Main Floor, Custom Blinds, Sound System Throughout. Character Abounds In This 2 Story, 4 Bedroom Brick Bobcaygeon Village Home. Walk To Town, Steps To Lake, Oversized Double Attached Garage With Brick Drive. Dining Room Seats 8. Family Room Has Airtight Stove And Door To Private Yard. 2 Bathrooms, Jacuzzi Soaker Tub, Modern Oak Kitchen, Very Flexible Possession. Well Maintaned Property Located In Business Core Area Of Bowmanville. Public Parking Lot Across The Street. Good Size Retail Area, Storage Area And Second Floor Two Bedroom Apartment. Approximately 4 Foot Easement S/S Of Property.. THIS HOME IS LOCATED ON A CANAL THAT LEADS TO STURGEON LAKE. THERE ARE A NUMBER OF NICE LOOKING HOMES IN THE AREA. LOTS OF WINDOWS TO ENJOY THE VIEWS..
Equestrian Centre Selling As A Turnkey Operation Known As "Windsong Equestrian Centre", Lesson Program, Full Boarding, Riding Trails, Camping Area, 42 Stall Barn, 70 X 160 Indoor Arena, 2 Large Sand Rings And Grass Ring.Numerous Paddocks, 4 Tack Rooms, Heated Viewing Room & Lounge.Indoor Wash Stall W/Hot & Cold Water, 2 Pc Washroom. **Completely Renovated**100' Of Waterfront On Pigeon Lake With Private Dock**Open Concept Main Floor**Great Room With Gorgeous Fireplace, Hardwood Floor & Lake View**Family-Size, Modern Kitchen With Hardwood Floor, Eating Area & Walk-Out To Deck**Sunken Sunroom With Picture Windows Overlooking The Water**Ground. Excellent House Backing Onto Conservation Space. Spacious Open Concept Main Floor With Large Livingroom/Diningroom Combo As Well As Main Floor Family Room With Cathedral Ceiling. Beautiful Hardwood Flooring. Large Eat-In Kitchen With Tons Of Cupboard, Ceramic Floor, Breakfast Bar And Walkout To Deck And Extra Deep Lot. Rice Lake waterfront year round home/cottage, 2 bedrooms, large kitchen/dining/living area, main floor laundry, large carport and huge detached shop/garage, good water depth at dock, handy for commuters. Listing Data provided by Obeo..
Lovely 4 Bedroom Home Located Just East Of Port Perry. Lots Of Original Charm With Many Updated Features; New Addition In '96 With Main Flr Laundry & Family Rm, Updated Windows, Huge Master W/Cathedral Ceiling, New Trane Gas Furnace In '09, New Shingles In '09, Roughed In Cvac, Updated Kitchen With Ceramic Floor, Paved Driveway, Separate Living Rm & Dining Rm, Detached Garage W/Loft, Backs Onto Greenbelt, Lots Of Parking. Very Scarce Multi Use Property 1/2 Hour East Of Toronto. Close To Hwys. 115 & 401. Comprising 15.5 Acres W/Lovely 4, 000/Sf Home, Pool, Tennis Court, 41, 000/Sf Computerized Greenhouse, 7500/Sf Barn, Pond, Fishing Creek & 100 Mature Apple Trees, 2700/Sf Office + A1 Landscaping. Quiet Rural Setting, Ideal For Hobby Farm Or Hydroponics, Herbal, Vegetable, Flower, Growing Etc. Stunning Country Cape Cod Home Legal In-law Apt. (5 min to 401 and town of Cobourg) With this home no cottage is needed, 1.35 acres of beautiful perennial gardens, spring feed pond and large decks will accommodate all your summer fun needs. for more information go to http://www.imforsalebyowner.ca/finalsearchresults. BRIGHT 4 BEDROOM EXECUTIVE FAMILY HOME ON LARGE MANICURED PIE SHAPED LOT IN DESIRED TERRY FOX SCHOOL NEIGHBOURHOOD CLOSE TO HOSPITAL, EASY 401 ACCESS AND ALL AMENITIES. MAIN FLOOR FEATURES: FAMILY ROOM, FORMAL LIVING AND DINING ROOMS, EAT-IN KITCHEN, LAUNDRY AND 1/2 BATH. SECOND FLOOR OFFERS: 4 SPACIOUS BEDROOMS, 2 FULL BATHS. Pizza Store In The Heart Of New Castle. Very Busy Location. Fantastic High Traffic Area.Freestanding Building, 3 Cars Parking At The Backside. Use To Be 'Square Boy Pizza' For Last 5 Yrs. Office Space In The Basement. All Chattels And Equipments Included In Price. Extras: 'Romeo's Pizza' Business For Sale. Canada free classified ads for Property for sale, Peterborough, Ontario, Property for sale free ads Peterborough, Ontario, Property for sale for sale Peterborough, Ontario, Property for sale to buy in Peterborough, Ontario. This page is a search result of classified ads for Property for sale category in Peterborough, Ontario. This listing includes classifieds for sale and to buy in Peterborough, Ontario. If you posted an ad on Property for sale, Peterborough, Ontario before please use Edit my ads button to change or cancel your advertisement. Property for sale Peterborough, Ontario ads Peterborough, Ontario, Property for sale classifieds Peterborough, Ontario, Property for sale free ads Peterborough, Ontario, ads for sale Peterborough, Ontario, ads to buy Peterborough, Ontario, FREEADS in Canada. Find here ads for sale, to buy and rent in Peterborough, Ontario. Goods for sale in Peterborough, Ontario, vehicles for sale in Peterborough, Ontario, Peterborough, Ontario real estate for sale, Peterborough, Ontario property for sale, property for rent in Peterborough, Ontario, business ads in Peterborough, Ontario, Peterborough, Ontario business classifieds, services in Peterborough, Ontario, Peterborough, Ontario services ads, jobs in Peterborough, Ontario, pets for sale in Peterborough, Ontario, Peterborough, Ontario dating, Peterborough, Ontario cars for sale.